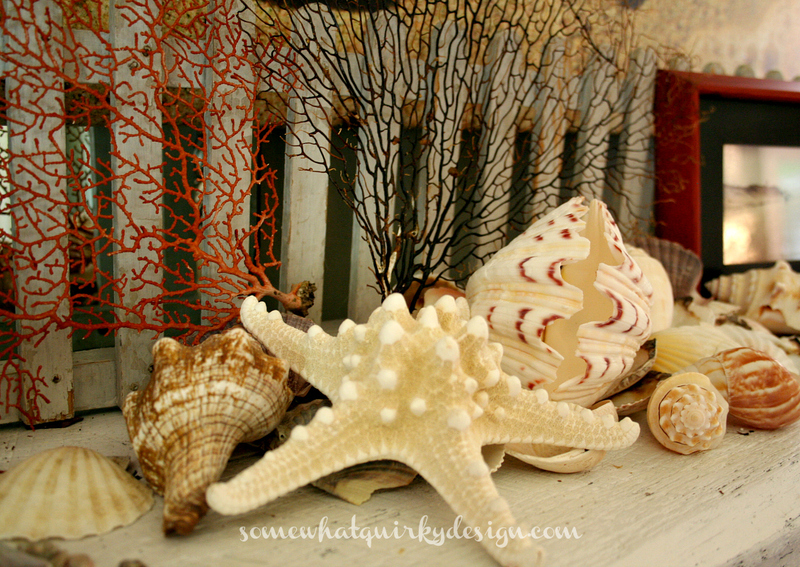 For years - and I mean YEARS - I've wanted to do a summer mantel that was all about the beach. Then two summers ago, as I was reading one of my favorite blogs, I saw these beautiful beach pictures. I loved one of these beachy picture so much that I flashed Karah an email and said "I'm going to steal" "can I use your picture?" and she wrote back and said "sure!" I was going to use her picture on my mantel. Now you guys know that sometimes I let ideas brew in my head for a loooooooonnnnng time. Sometimes to the point of fermentation. Fortunately, fermented ideas don't smell as bad as fermented food. I was still brewing up my summer mantel when the good folks at Easy Canvas Prints contacted me and asked me if I would do a product review of one of their beautiful canvas prints. I may let ideas ferment, but I'm not stupid. "Why yes, I would gladly do that, and I know just the picture I want." That's one of the benefits of having all these ideas tucked into your head all the time. You're ready for a good deal when it comes along! So I went to their website, built my canvas, and 5 days later it was on my mantel! This is a large - 24" x 36" piece but it is still beautifully detailed and just what I had been imagining all this time. I love it that Easy Canvases come ready to hang. Having the wrapped canvas means you can hang it 'as is'. You can certainly frame it - and they even have a framed option on the website - but framing is not necessary at all. It is also possible to get your canvas with a 1.5 inch wrap. Mine has a 3/4 inch wrap, but the thicker wrap is perfect for some shots and would look awesome in a grouping. Look at the detail in the corner of this picture. The foam from the tide and the details of the really old coral and rocks are so clear and amazing looking. Which reminds me - the service this company provided me was excellent. The original picture I sent them was one I just pulled from the blog post. When the technicians blew up the picture they determined that it would not be of the quality that I would find acceptable. They notified me that my order was on hold and provided me with a PDF that enabled me to see what the finished product would look like. They also gave me some suggestions as to how I could get better results. Of course one of the suggestions was to use a higher resolution picture. So I contacted Karah again and asked her if she would please send me a copy of the picture in its original size. She is pretty much a darling and sent me the picture while she was on vacation! Thanks Karah! Easy canvases are just that - easy to make. You build your canvas right on the web site. All you have to do is pick the size and the frame that you want, download your picture, approve your proof and voila - you're done. The price points are reasonable and they run quite excellent specials all the time. And just FYI - this picture was taken in her "before DSL" days. This picture was taken with a point and shoot. Can you imagine how beautiful this picture would have been with a more modern camera! And just so you'll know - I did receive product from Easy Canvas Prints. But these opinions are mine. I promise I will always tell you the truth, and I wouldn't tell you I liked it if I didn't. I hope you will check them out. I want to hear about the project(s) you've got in your head. The one that you've wanted to do for ages but haven't done it yet. Tell me about it so I can do it, too! I love your mantel - and that print is just gorgeous!!! Turns out your ideas ferment really, really well! I'm going to have to try this out soon! After the long wait, I hope you are enjoying your mantle! I have several canvas photos in my home and they are beautifully done. You'll be loving Karah's photo for many years- it's wonderful. Sit back and imagine the sand between your toes. I'm always looking for places to get photo reprints and enlargements, and on canvas makes anything more art like. I'm definitely going to check them out. I love this Karen - have to look into that site - I'd love to have photos of the kids on this!!! 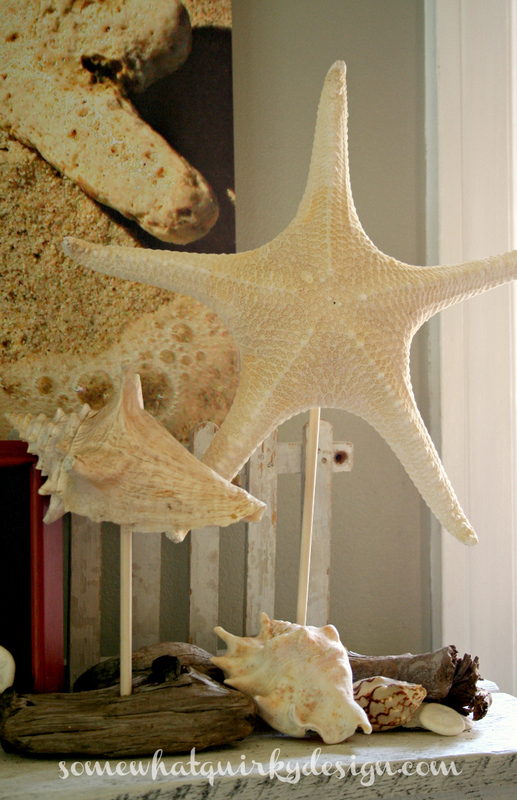 love your mantel - enjoy it all summer! 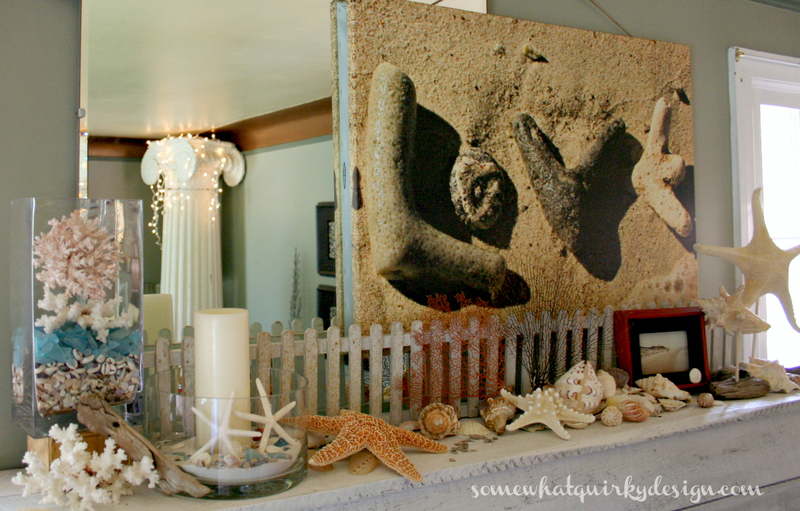 Karen, your mantel is gorgeous and I love that beachy canvas! 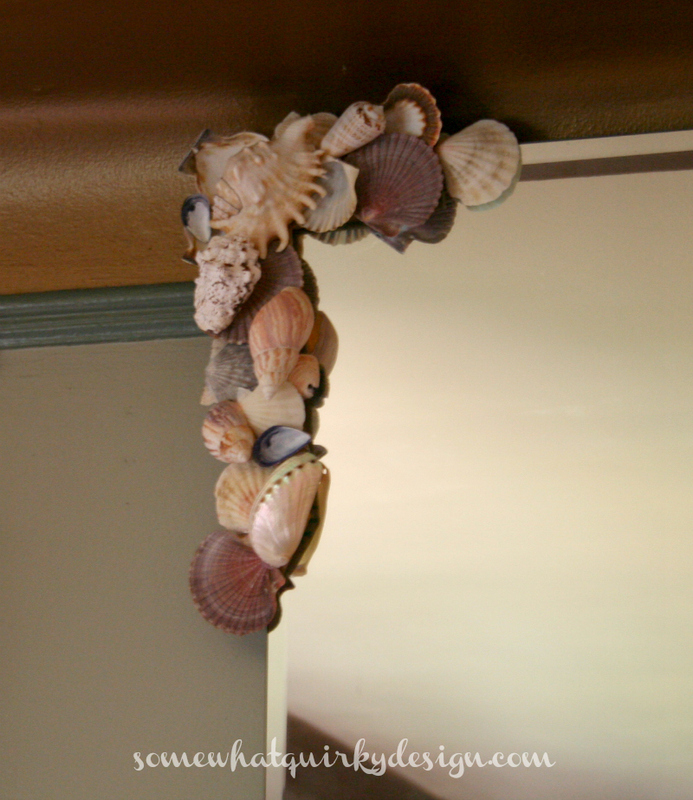 I'm working on some beachy stuff myself this week and snagged a few ideas from your mantel. Thanks for the inspiration and for a cool product review! I "LOVE" it. See what I did there. LOL Seriously, what an awesome canvas ... and imagine how beautiful it could be with not only a better camera but a better photographer. Those rocks had no idea they were going to be famous!! Thanks for the heads-up. I can think of some photos for which this would be an excellent option. Your mantle looks great. So summery! Wow! That looks fantastic! I love how that canvas turned out....what a great site! I'm sure you'll use that again and again! Love this because we love the beach! My dream is to get a beach house one day. First the kids have to get out college and then our family plan is we are all going in to get one! The beach just soothes my soul. Beautiful! Growing up in South Florida and now living in North Georgia - it's such a different terrain. 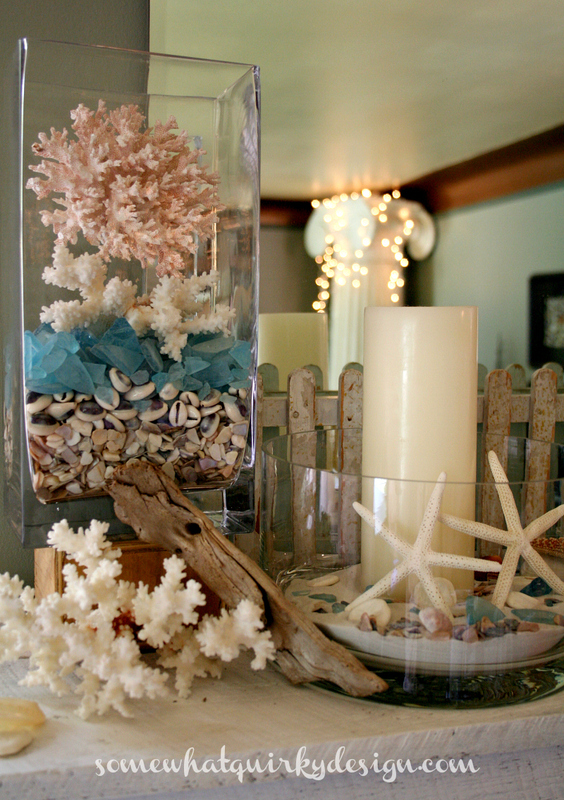 I'd love to do some beachy decor; but i can never get it to fit into the country setting we're now living in. You make me pine for sand between my toes! Love the print!!! I love this idea! There are so many bloggers out there taking great photos, I would love to do this! 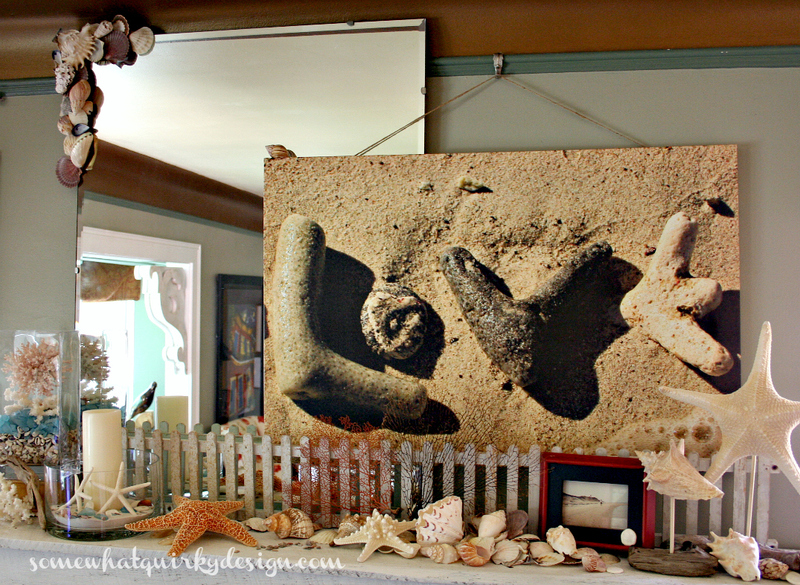 Thanks so much for sharing your beach mantel at my party today...love that free canvas. Way to go Haven roomie!!! !